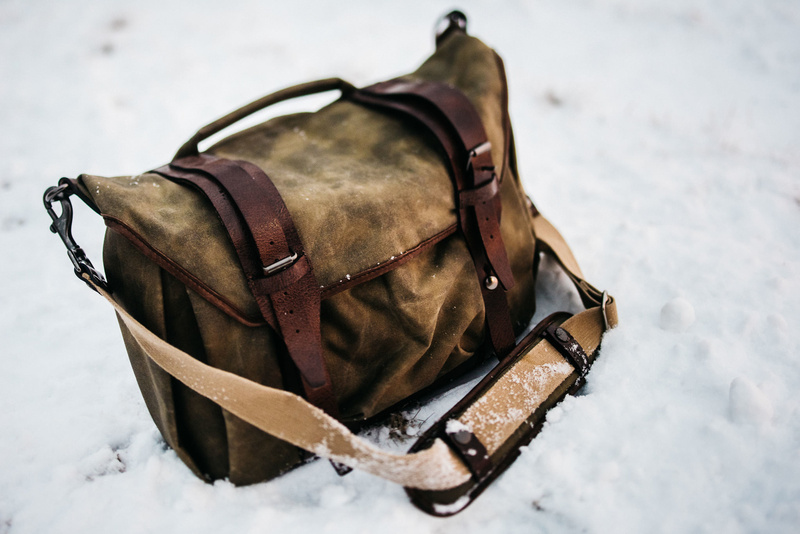 While there's no such thing as one bag for all purposes, Wotancraft may have come pretty darn close with their Trooper. 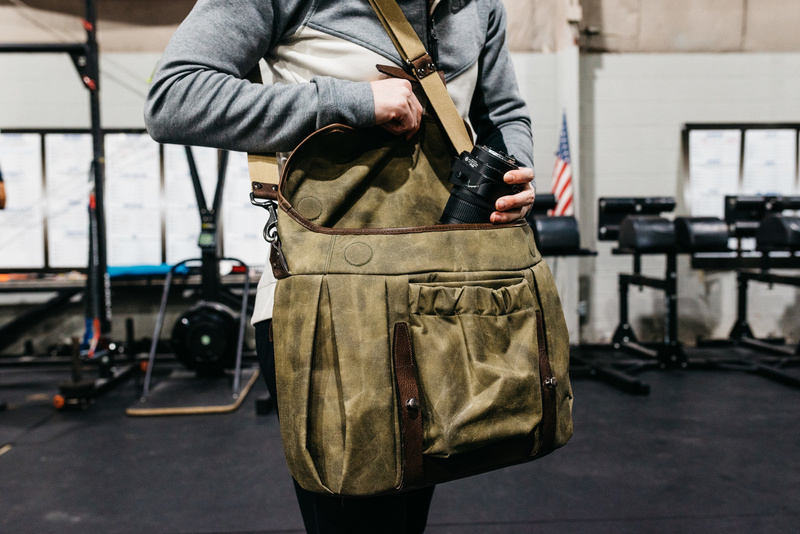 Read on for our take on this modular military-style messenger. Most photographers own more than one bag. Okay, so that may be an understatement. I'll start over. Most photographers own more than five bags. While there are a number of reasons for needing or wanting more than just one in your arsenal, top of that needs list is needing the right tool for the job. But what if you had a blank canvas that you could configure individually for every use? By this point, you may be at least broadly familiar with Wotancraft. 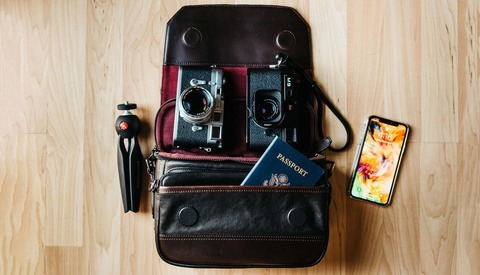 We've reviewed their backpack, The Commander; their duffel, The Ranger; their regular messenger, The Scout; and even their high-end luxury leather shoulder bag for mirrorless cameras, The Ryker. 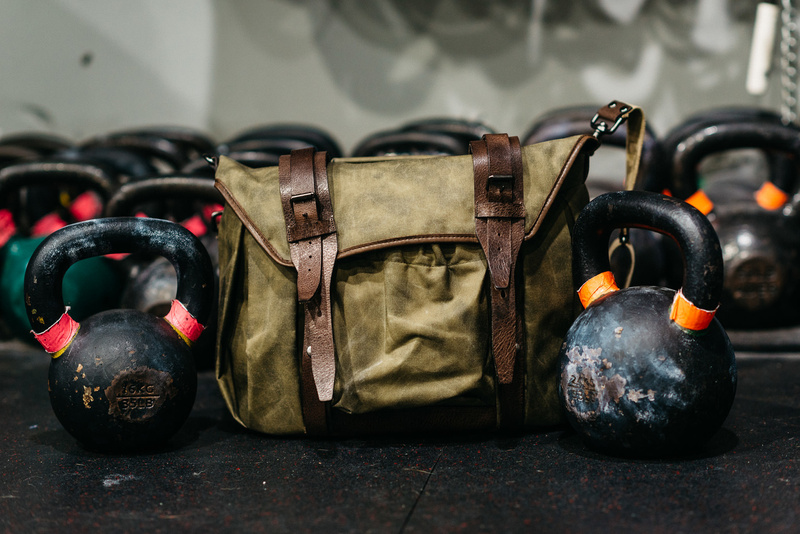 What most people first notice about their lineup is the clear vintage military-inspired theme that starts with the names and ends with rugged, utilitarian waxed canvas and leather accents. While it may not work for everyone, it certainly works for me. The designs are overall fresh, well-executed, and they stand out enough without being distracting. The Trooper takes this military inspiration one step further by incorporating the idea of modularity. While camera bags with removable Velcro dividers are an industry standard, having every single aspect of the interior movable and removable is not. Need your laptop for a shoot? Put in the laptop sleeve. If you don't need a laptop, then just take it out. The laptop sleeve itself replaces the back wall of the bag interior and can have regular dividers attached to it or even the modular pockets. Wotancraft's decision to make an internally modular bag is commendable, because unlike most externally modular bags, the Trooper always looks like a normal daily-use bag as opposed to some modern art hodgepodge of geeky modules stuck to the outside of your carry. 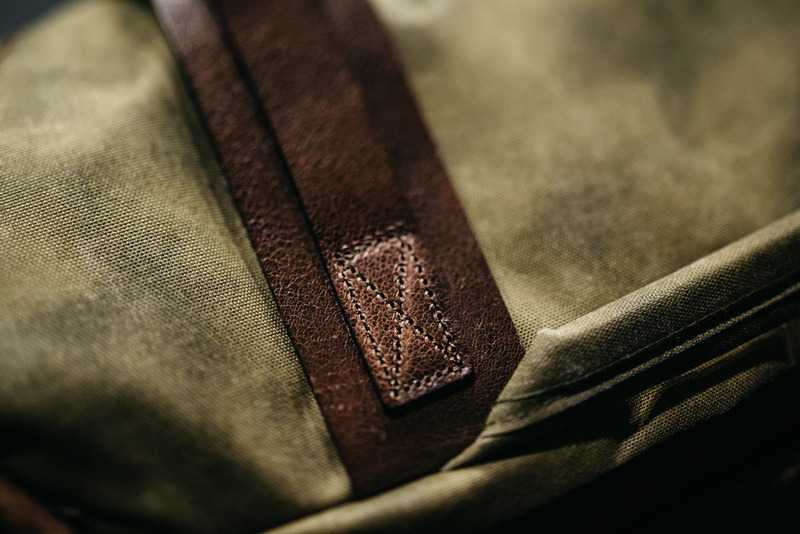 Having now personally used four different Wotancraft bags, there is something every single one has in common and is immediately apparent the first time you put one in your hands: top-tier craftsmanship screams at you from every stitch, rivet, flap, and zipper. These bags are genuinely handmade in every sense of the word to the point where we've heard of small requests and modifications being honored (like adding or removing a handle) on bags that are then made to order. While Wotancraft's bags are hardly cheap, I have yet to find any bag on this level at this price point. 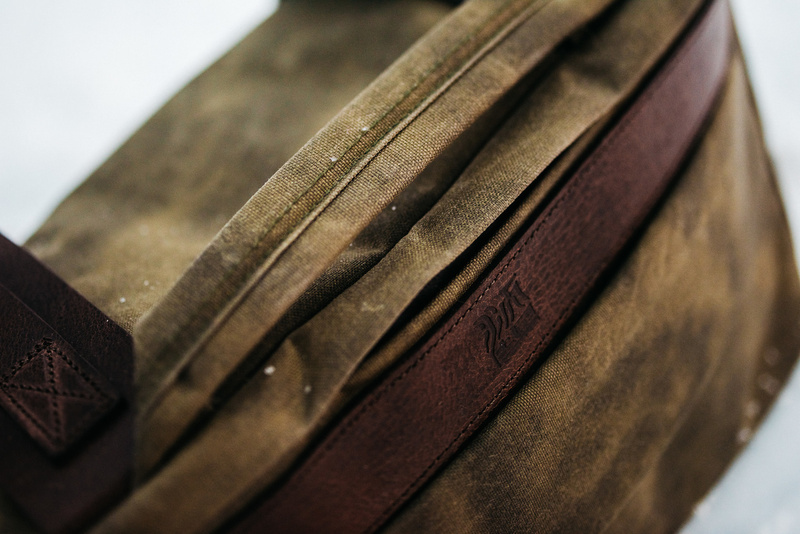 The Trooper's predominant material is a proprietary Cordura 500D waxed canvas they call W.A.L. that was first introduced to the line in 2014. It's fantastically water-resistant as it's first treated with a wax layer and then topped with polyurethane. It's abrasion-resistant and will withstand scrapes and punctures even from sharp metal objects, and it won't rip, pull, or tear from the seams. It's lightweight to the point of being half the weight of traditional cotton waxed canvas used it most camera bags. Case in point, the large version of this bag weights a respectable three pounds flat. Of course, the vain photographer in us also appreciates the incredible wear-ability of this canvas. 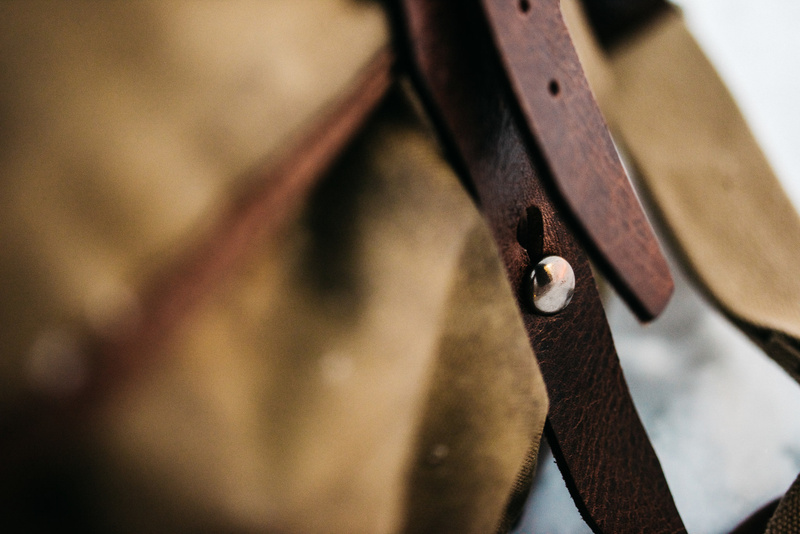 The more you use it, the more beautifully distressed it becomes, much like the vegetable-tanned full-grain cowhide leather used on the straps and flaps. 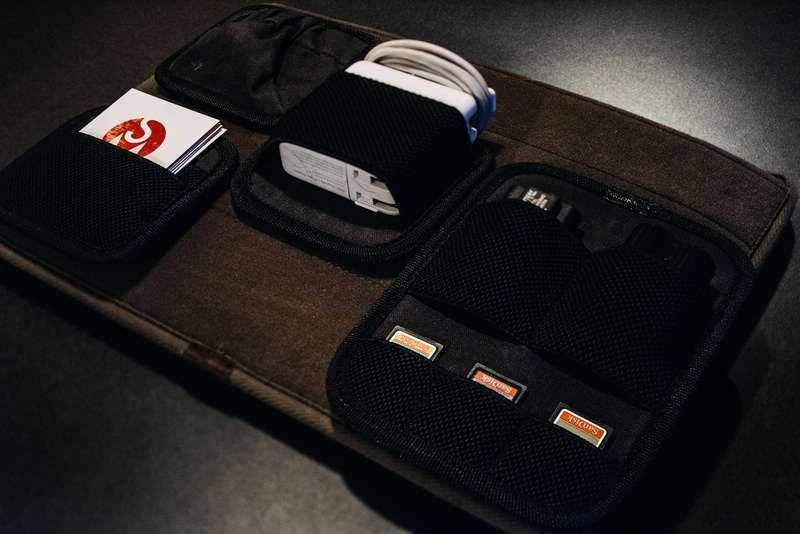 As a company, Wotancraft tends to have us pesky Leica M users in mind and most of us are pretty paranoid about scratching up our incredibly expensive beauties, so they tend to design bags that limit zipper on the camera compartment. Unlatching the two leather straps on the front that are affixed with a traditional strap-and-peg shows you Wotancraft's unique "seashell flap," which not only avoids the use of zippers, but also has a clever round, tapered opening that provides a gap-free compartment when closed, and there's also no bunched-up material on the sides, which is common on backpacks and messenger bags. Even when the flap isn't totally battened down, internally-mounted neodymium magnets keep the flap down and held against the bag. 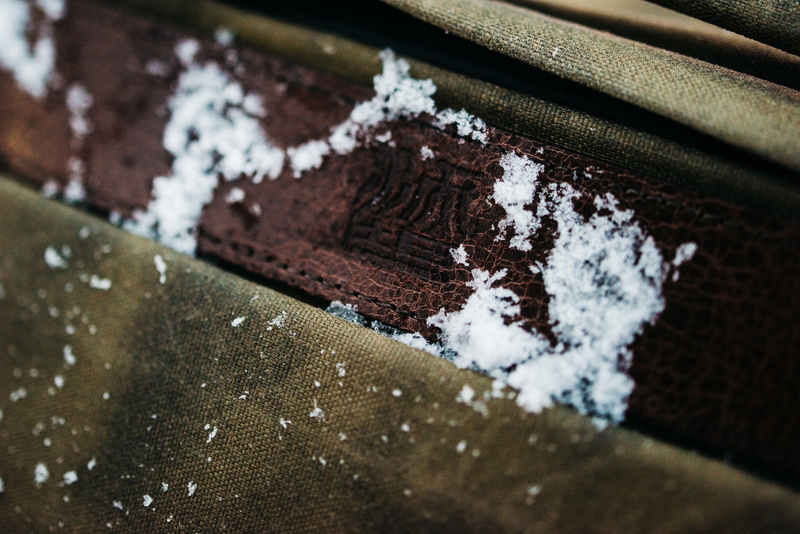 Between the tapered opening and the magnetic flap, there's no worry of rain or other elements getting into the bag, and that's a feat for not utilizing a zipper. The leather straps are also essentially two-in-one. 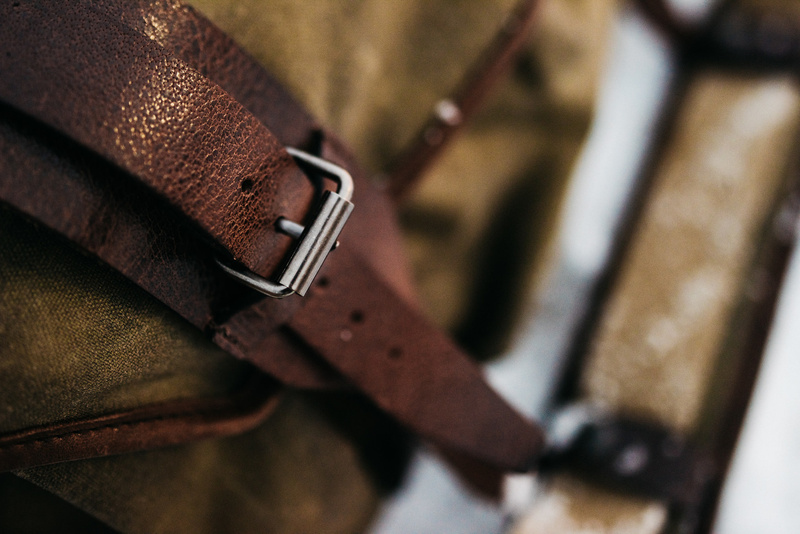 While the main use of the strap is to seal the flap shut, there're additional smaller straps which use more traditional buckles that rest on top of the main ones. These can be used for attaching something for external carry, such as a tripod. Initially, I always wish Wotancraft's leather was more broken in from the get-go. It's gorgeous, high-end leather, but I find the leather accents, such as these straps, tend to be pretty stiff when you first get them and need months of heavy use to really soften up. On the other hand, these are bags designed for life, and they will most certainly improve with age. There's somewhat of a sense of satisfaction to wearing in your own leather. Maybe that's just me. I'm weird like that. In the case of these straps, the initial stiffness does tend to keep the flap held down somewhat until the leather softens up. It's not something you'll be able to fold back and have it stay put until that point. Once inside the bag, you're met with the Trooper's party piece: one big open compartment lined with medical-grade micro-fiber. It's a blank canvas ready to be populated as you see fit. The bag comes with a laptop sleeve module, two large dividers, and two small dividers which will make up the basic layout of your bag. 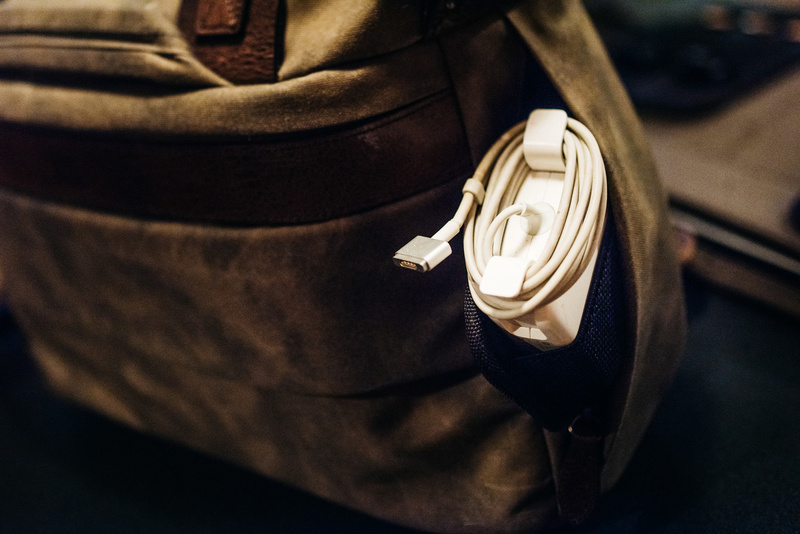 Just like your typical configurable bag, it's all done with Velcro. 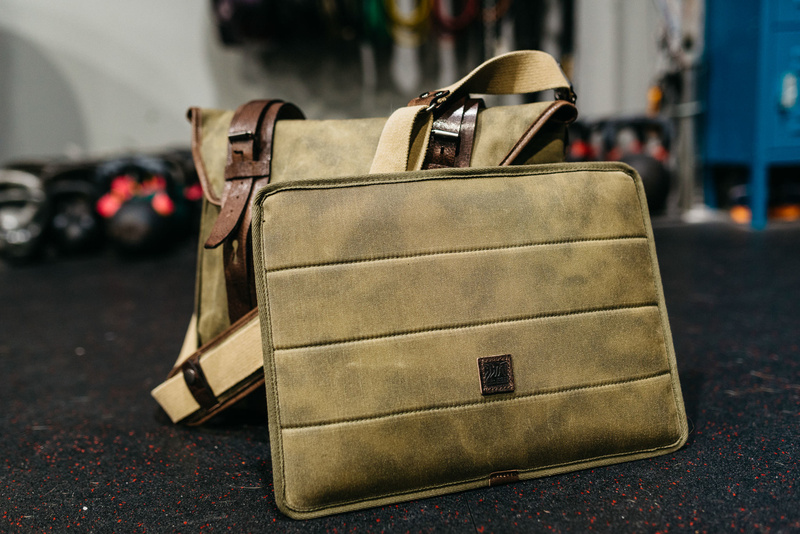 The laptop sleeve is fascinating, because not only can it be pulled out of the bag and used as a standalone laptop sleeve (and look pretty darn good while doing it), but it can actually become the back wall of the bag. Before putting in your dividers, slide the laptop sleeve in with the micro-fiber side forward, and you can affix your dividers and modules to it. 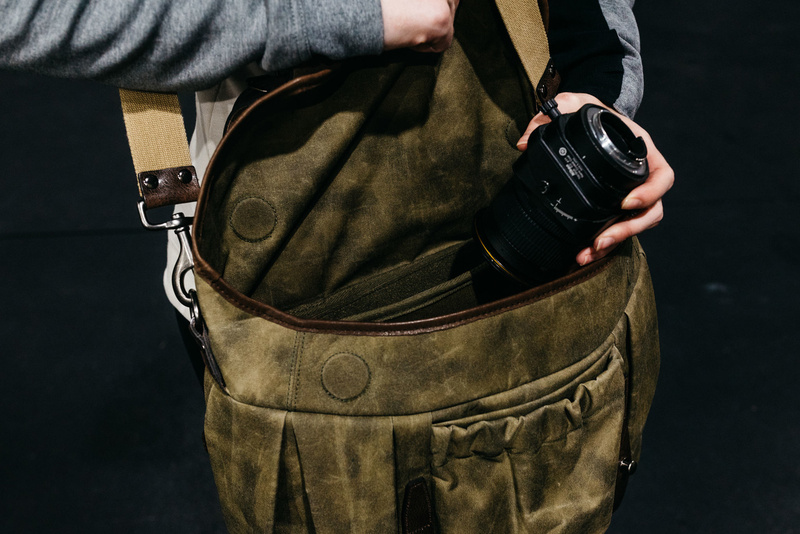 I've fallen in love with this, because I typically only need my laptop around 25 percent of the time I take my camera bag out, so all that other time I can have more room for accessories or a big, gripped camera. When looking at the Trooper for the first time or really, even putting your hands on it and digging around, one of the most striking things compared to other bags is the apparent lack of pockets and storage. But do not be fooled: there are multiple external pockets, and each is designed with security in mind. The first and most obvious is the one front and center. If you do notice a pocket, this is the one. Not only is the top opening covered by the bag's flap completely hiding it, but the top is elastic and folded inward, making it difficult to sneakily access. And there's a bonus: the pocket has an integrated divider, giving you two storage areas in one. The second set of pockets are even more secure as they are only accessible from the rear of the bag facing you as it's being worn. While the top flap is pretty obvious, it took me nearly a month of using this bag before I realized there were two vertical side pockets as well. While the main rear pocket is probably best served by only holding flat items, the two side pockets are surprisingly spacious as they actually wrap around towards the front of the bag. If the included pockets aren't enough for you and you want more "fine-tuned" storage options, the cherry-on-top of the modular system is the optional modules. A couple have obvious purposes, such as the card wallet or the one that holds memory cards and batteries, but the others can hold whatever you need held, such as cables, chargers, headphones, water bottles, prisms, brass piping, aluminum foil, or whatever other little toys and trinkets you like to travel and shoot with. Each of these modules has a Velcro back and can be attached anywhere in the interior of the bag you wish. I suppose you can use these modules on literally any camera bag made by anyone that is designed to use Velcro dividers. 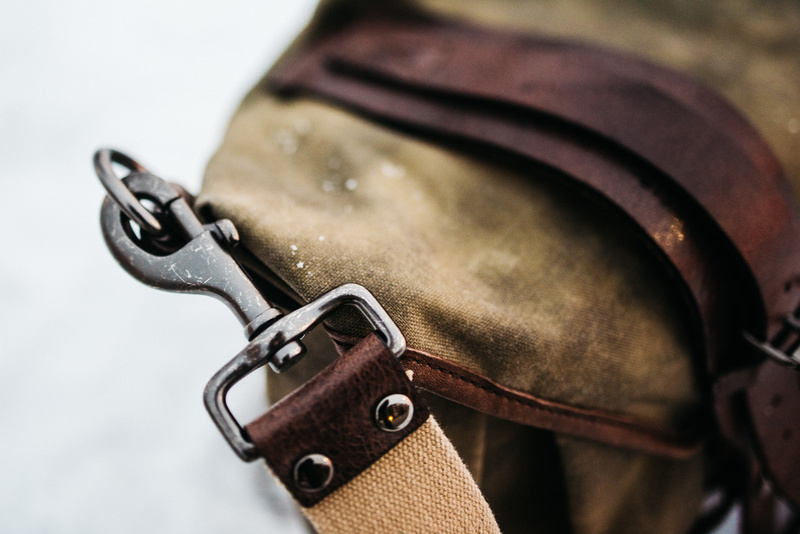 Overall grab-and-go usability of the Trooper is enhanced by a permanent top handle, which is a very important feature to me, as well as an included strap that can be attached to the D-rings. The strap itself is not your typical throw-away two-inch black nylon strap; this thing is as nice as the rest of the bag. It's a really substantial woven fabric with studded leather ends and metal clips. Even the shoulder pad seemingly has more attention to detail than many entire bags. It's filled with Latex foam which is far more comfortable (and expensive) that regular EVA foam, and it's stitched with leather between two layers of canvas, the same as the rest of the bag. It can be added to or removed from the strap with two buttoned leather straps. I did run into a bit of an issue here, though. I'm pretty short (5'6") and also tend to like my strap a bit on the shorter side for a messenger. With my first strap configuration, the slide buckle went right where the shoulder pad needed to go and there was no way to buckle it on without it being almost off my shoulder. My choices were to either deal with the bag hanging lower than I typically like or to go with an across-body approach. While not the end of the world, in a bag that seemingly is all about being customized exactly to the owner's individual needs, this was out of character as I had to adjust to it. If you're taller than about 5'7" or use it cross-body, you likely won't even remotely encounter this issue. 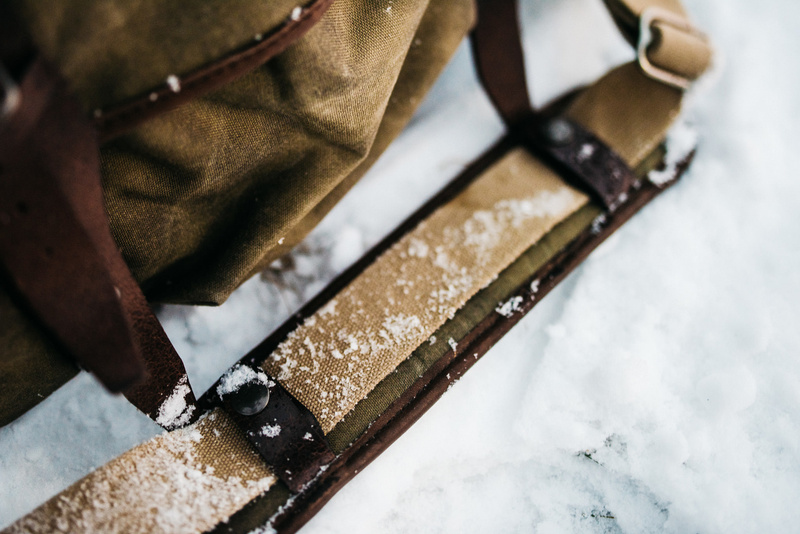 The Trooper has just enough of a squared bottom and overall rigidity that the bag stands up straight sitting on the ground without any assistance, making that grab-and-go action I desire all the more practical. In some cases you may even desire to go strapless and rely entirely on the handle, and this is a bag that lends itself well to that. And have no fear, the bottom is actually leather so you don't have to worry about wet and dirty ground soiling the pristine look of your canvas. Additionally, there is a luggage handle slot on the back that you just pull out and slide over the handle on your luggage so your Trooper can come along for the ride through the airport. Unlike other bags I've used with this feature, the Trooper keeps it relatively hidden, as it's integrated into the back of the bag and is Velcroed down when not in use. 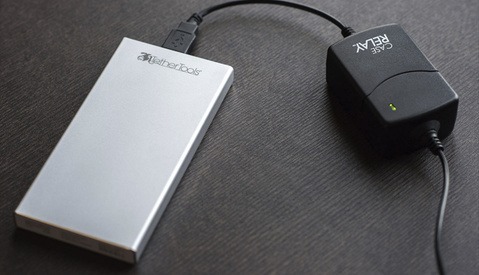 Having used the Trooper almost exclusively for about six weeks, overall usability is pretty fantastic. Without the laptop sleeve, the large version has been more than big enough for a gripped Nikon D810 and three large f/1.4 primes. The interior is remarkably deep, to the point that a 70-200mm f/2.8 will easily and comfortably fit entirely without even coming into contact with the flap, and this is just the large size. With that said, gripped bodies can start to push against the design constraints from a width perspective. If you overload the bag to any point where you're pushing against the natural dimensions of the bag, you're going to immediately start running into issues with the flap closing easily, whether that's the top resting nicely on the magnets or whether you have to fight to get the leather straps on the pegs. With as much volume as there is in the bag, I was surprised at the times where I found taking the grip off my bodies made a big difference in the flap playing nicely. Taking the laptop sleeve out certainly helped, but it wasn't perfect. The bottom line is there's tons of room, but make sure you're using it in the way in which it's designed. Speaking of dimensions, let's talk about sizes. The Trooper also comes in extra large alongside medium, small, and extra small. I cannot think of a single camera bag model off the top of my head that comes in five distinct sizes. When you combine the number of sizes with the modular nature of this bag, this really is one bag to rule them all. So which size is for you? XL: The sleeve will hold any 15" laptop, even your old school 2007 MacBook with a CD rom drive, or your Dell XPS gaming machine. 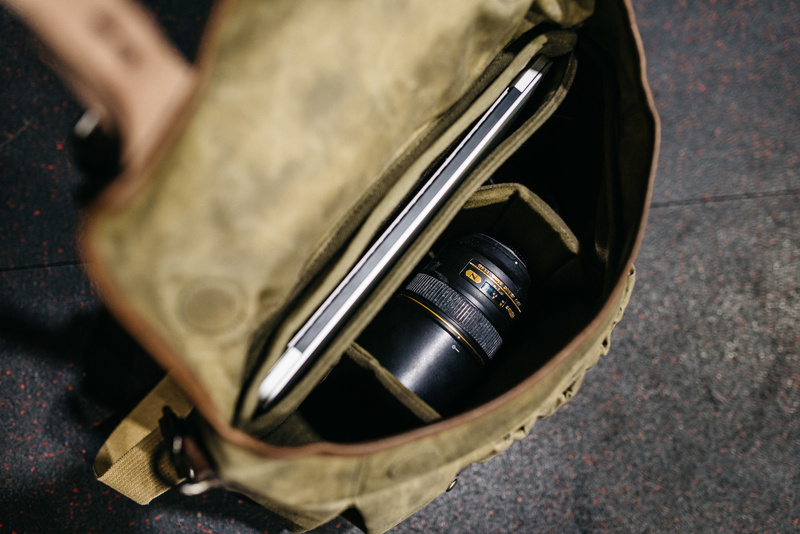 The main compartment will easily hold a DSLR and four lenses or a DSLR, three lenses, and a mirrorless camera or two non-gripped DSLRs and four lenses. It's big. L: This is the size I've been using, and the sleeve will hold any 13" laptop and even the very newest, thinnest 15" MacBooks. No, it won't hold even a Retina MacBook Pro from 2012. Trust me, I tried. The main compartment will easily hold a DSLR and three lenses or a DSLR, two lenses, and a mirrorless camera. Frankly, these bags are so remarkably deep, I wouldn't bother with a large or extra large if you're only sporting mirrorless. There's just a lot of unused vertical space, and you're probably best off going to a medium. But then again, it depends on your laptop needs. M: The sleeve will hold most thin 13" laptops like the newest 13" MacBook Pros or full-size 12" laptops. This is a great bag for mirrorless rigs. It's definitely short enough to do away with the extra vertical space that could make the bag feel excessively cavernous. It will easily hold a mirrorless camera like a Leica, Fuji, or Sony and upwards of 3-4 lenses. S: The sleeve will hold an iPad or similar. This is a bag for run-and-gun mirrorless setups with just 2-3 lenses. 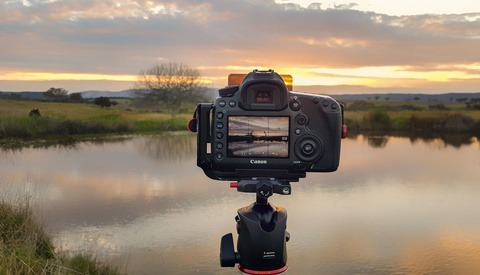 You could potentially manage a smaller DSLR with no grip and 1-2 small lenses. Otherwise, everything's the same as the big bags, just scaled down. There's one leather strap for the flap instead of two. XS: What a little baby baby, but it can handle a small mirrorless rig like a Leica M with up to three lenses. It can even take a small ungripped DSLR and a single attached lens. You can squeeze an iPad mini into the back pocket. You can even fit a point and shoot camera into one of the two rear side pockets. It's amazing how useful such a small bag can be when traveling light. Ultimately, it looks like Wotancraft has really tried to make not just a camera bag but a bag for all. It really shows, not just in the modular design that can easily accommodate photography, general travel, or work, but in the fact that they've made five sizes, each identical except for interior volume. Each has the same materials, the same handmade effort and quality, the same modular components, and even the price range doesn't deviate as much as you'd think. The bags (without modules) range from $149 to $319, which not only is on the affordable side of Wotancraft, but that's on the affordable side of all mid-to-high-end bags. Despite having ample volume, the top flap doesn't like when the bag is pushed outside its designed dimensions. Don't overfill the bag. Leather and canvas benefit greatly from break-in. Leather straps in particular are mildly stiff out of the gate. No modules aside from the laptop sleeve are included. If you want the whole set, that can increase the price around $100. At certain strap lengths, the adjustment buckle interferes with the shoulder pad. I can't recommend the Trooper enough or really any Wotancraft bag for that matter. Each one impresses me in a totally different way, and they are so well thought out by designers that obviously are photographers themselves. And that's the kicker: this is a bag for anyone. You don't need to be a photographer. There's really nothing saying that you have to use a Trooper for your cameras. So maybe, just maybe I was wrong and Wotancraft has made a bag for everything and everyone. You can get yours directly from Wotancraft. Why the hell messenger camera bags are usually so voluminous ??? Messenger bags are for quick and frequent access, not for carrying loads. I really don't get it. As an example, I bought the Peak Design messenger, I regret it. They're a PITA to carry, you're not happy, your back isn't happy, it bumps on your hip when you walk, it bumps on other people, it takes to much time to pack/unpack, ... I use a small messenger (the size of a woman's handbag) for the stuff I need on quick access and it's just fantastic. The rest goes into a backpack for carrying. (And even most of the backpacks are horrendous too for that matter, but it's another story). You'll thank yourself later should you choose that strategy. Indeed. My back hurts just looking at this thing. It's beautiful, sure. But I couldn't imagine carrying it with much of the intended load for very long. It's remarkably light for the size due to the kind of canvas they use. This is also the L size. They make three smaller sizes down to XS. Looks like a sack, not like a bag. Agree. They try way too hard to make it tough and rugged and it's just looking tired. I'm using NG backpacks for photi gears and ThinkThank for drone stuff. This one looks realy chick, it nice for every day usage. Ouch. I am sure it has some great qualities, but I have to say, it simply hurts my eyes. 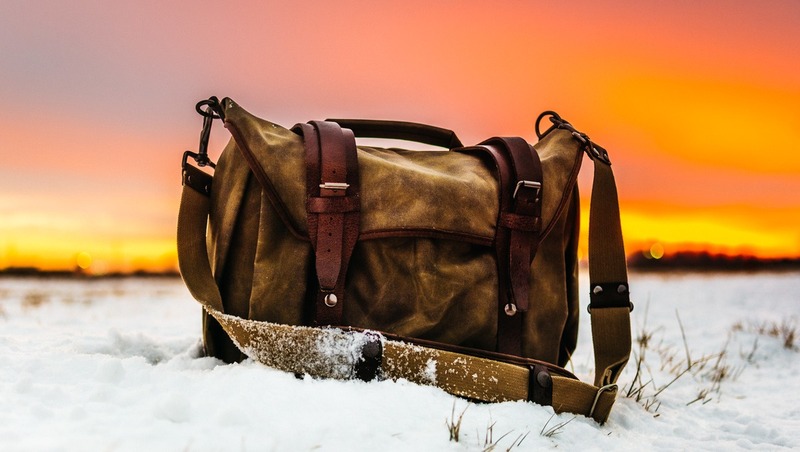 "I can't recommend the Trooper enough or really any Wotancraft bag for that matter." I almost fell over laughing when I read this. It says it all. Reminds me of the days when I reviewed performance appraisals and job "recommendations". Well done! It's an honest recommendation. I've used probably nearly a hundred bags at some point over the past decade, and Wotancraft consistently makes some of my absolutely favorites. I gave the bag a fair shake, clearly expressing the multiple things I took issue with. It's not perfect, but I genuinely like it, think it's well-done, and overall recommend it. This reads painfully as a paid commercial rather than an informative article. When a bloody potato sack gets a lengthy "article" declaring how it's the "best bag ever" ... it's probably time to question Fstoppers as to reader identification features for a legitimate article ... and similarly identifying features of what is obviously a paid advertisement. It's an honest recommendation. I've used probably nearly a hundred bags at some point over the past decade, and Wotancraft consistently makes some of my absolutely favorites. I was not paid to write it. This is the large size. They make three smaller versions all the way down to extra small. Will the medium fit a single FF DSLR and three lenses? D810, Tamron 15-30, 24-70 and Nikkor 70-200 F2.8?